"Sleigh reveals that 'fact' and 'ruin' are the same, as much as we’d like to believe our little mortality is a real commodity. He takes meaning to its extreme, pushing logic to become philosophy — taking the rough stuff of this earth, rolling it around in his hands and then letting us know just what it’s worth....Poetry is Sleigh’s task here and he’s one of a handful of writers today upholding the brightest part of our canon....Sleigh makes poetry go beyond itself. Like Wallace Stevens there’s an imperative beneath the line, words as a consequence of fine-grained thought." "With these poems, Sleigh travels from battlefields ranging in location from Baghdad to Brooklyn’s projects, interrogating the increasingly shaky notion of truth and the extent to which the work of artists (Piero della Francesca, Jimi Hendrix) might offer some redemption." "Sleigh (Station Zed) blurs the boundary between art and artifact as he lyrically documents war zones in Libya, Iraq, and Syria in this 10th poetry collection, released concurrently with The Land Between Two Rivers, a new book of essays. . . . Sleigh brings readers close to trauma with a lyrical treatment from which one wants to turn but cannot." "In House of Fact, House of Ruin, Sleigh devotes the first section to American experiences in the Middle East during the decade-plus of American-involved war. Whether interpreting the words of the officer who wonders the cost of participating in enhanced interrogation, or the voice of a soldier waiting to go into battle, Sleigh carries readers into the thick of it." "Sleigh’s new poetry collection is informed by his reporting on the lives of refugees, but it is instructive to see the difference between his modes of writing and seeing. . . . What Sleigh helps us see in these poems is something deeper than journalism can offer: a heart and mind torn by inhabiting a world but not fully grasping its pain." 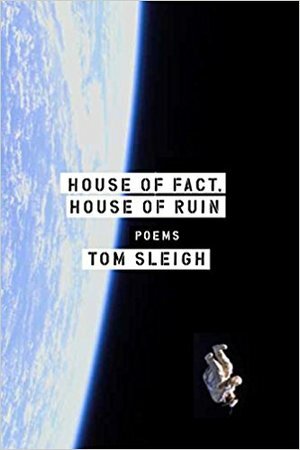 "With his previously published collections such as Station Zed and Army Cats, one might easily assume that Tom Sleigh would face great difficulty when attempting to produce an even more intriguing and sonically appetizing collection. House of Fact, House of Ruin, Sleigh’s latest collection, accomplishes this task in addition to much, much more."